Service: 19th National President Woman&apos;s Relief Corps. Mrs. Calista Robinson Jones, of Bradford, Vermont, past national president of the Woman's Relief Corps, a highly accomplished lady who is held in high honor at her home for her zealous labors in behalf of community interests, and throughout the nation for her splendid leadership in patriotic works, is a native of the state, born in Chelsea, March 22, 1839. Her parents were Cornelius and Mary A. (Pike) Robinson. On the maternal side she is a direct descendant of Richard Lyman, of Lebanon, Connecticut, who was one of the men who marched to Cambridge "for the relief of Boston in the Lexington Alarm, April, 1775," and afterwards enlisted for three years and served as sergeant under Captain Benjamin Throop, in the First Regiment, Connecticut Line, Colonel Jedediah Huntington. Two other ancestors of Mrs. Jones also served in the Revolutionary war, and her great-great-grandfather. Solomon Robinson, took part in the battle of Bennington. Mrs. Jones received a common school and academical education in her native village, and afterwards graduated from the Rutgers (New York) Female Institute. 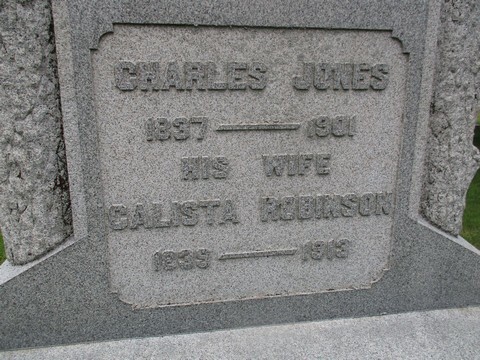 She was a teacher in the Washington school in Chicago, Illinois, for three years ending in 1864, when she returned to Vermont and became the wife of Mr. Charles Jones. Since that time, a period of nearly forty years, she has been actively and usefully identified with the public interests of the village and of the state. Mrs. Jones is more widely known, however, for her brilliant leadership in patriotic work, for the results of her effort are recognized through out the nation, and have won for her elevation to one of the most honorable and useful stations to which an American woman may attain, that of national president of the Woman's Relief Corps, a body auxiliary to the Grand Army of the Republic , and to whose headship some of the most exalted women have aspired. With the blood of Revolutionary soldier ancestors throbbing in her veins, her patriotic spirit was thrilled by the at tack upon Fort Sumter, in April, 1861, and almost before the echo of the rebel cannon in Charleston harbor had died away, she and three of her fellow teachers in Washington school, in Chicago, made a fifteen-foot bunting flag, every star in it sewed on with their own hands, and this was the first national flag to be raised over a school building in the city to inspire the children with sentiments of loyalty to country. During the ensuing three years Mrs. Jones assisted in collecting and distributing sanitary and hospital supplies, contributing to the comfort of thousands of soldiers passing through the city enroute for the seat of war, or returning from prison pens, and of the sick and wounded in the hospitals. She was among the, foremost in similar effort after her return to Vermont in 1864, and after the war she became a charter member of the Relief Corps auxiliary to Washburn Post, Grand Army of the Republic , in Bradford, and served for two years as its president, and in some other of its offices to the present time. Her activity led to recognition by the department convention of Vermont, of which she became, by successive election, junior vice president, senior vice president and president. She served most creditably and usefully upon various important committees in the state and national bodies, and rendered effective service as department patriotic instructor, having been appointed a member of the first national committee on patriotic instruction, a position for which she was pre-eminently well fitted by reason of her experience in educational work as well as by her intense patriotism. 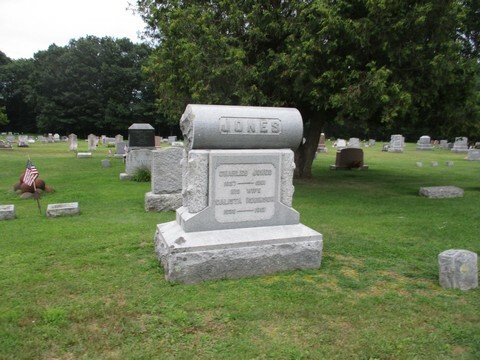 Mrs. Jones was also an active member of the Andersonville prison board of the National Woman's Relief Corps, and was na tional junior vice president in 1899. Mrs. Jones was advanced to the high position of national president of the National Woman's Relief Corps at the convention held in Cleveland, Ohio, in September, 190 1. Her election by a unanimous vote was an eloquent tribute to her zeal and ability in promoting the objects of that beneficent organization, and was also a heartfelt expiessiou of confidence in her future usefulness in yet farther advancing its lofty purposes. Her duties were performed in an admirable manner, as was attested by the ovation with which she was greeted at every department convention. Grand Army encampment. Army Corps reunion and social gathering which she attended throughout the country. During her official visitation she frequently traveled in company with Commander in-Chief and Mrs. Torrence. During her term of office, and largely due to her effort. Memorial Sunday and Memorial day were more generally observed than ever before. Largely increased contributions were made to the Southern Memorial Day fund, and the amount of money sent south for Memorial day purposes was larger than ever before. Patriotic days came to be widely observed. In response to a Flag Day letter of her writing, on behalf of the Woman's Relief Corps, and which was joined in by the Grand Army of the Republic , flags floated from ocean to ocean. The flag salute was introduced in schools throughout the land, and the children were brought to sing the national songs with enthusiastic spirit and to engage in patriotic programmes of rare merit. At the twentieth annual national convention of the Woman's Relief Corps, held in Washington city, October 9, 1902, Mrs. Jones delivered an address which was received with deep approbation, in which were epitomized the operations of the body during the year, and in which she gave expression to sentiments of the loftiest patriotism. "We should not forget that the gift was suggested and its usefulness made possible by the library work which was begun and carried on for a score of years by the unselfish and unaided efforts of the women of Bradford. It is appropriate, and will, I believe, be of permanent value, to preserve the history of their work, and, so far as we can, trace the progress from the first small beginning to the time when it had become of such importance as to attract the interest and be the object of the wise beneficence of Mr. Woods. Who can measure the good which has resulted to this community from this patient, persistent unselfish work of these wise and public-spirited women? They deserve our praise equally with him whose name this building bears. While his name is carried upon the portals of this library, their should be borne upon tablets upon its walls, that, in the years and generations to come, those who enjoy the benefit may not forget how much thev owe to those who made its existence possible." By her marriage with Mr. Jones, Mrs. Jones became the mother of a daughter, who, possessing in high degree the lofty traits of her mother, has also lived a life of great usefulness. Mary Ellen Tones was born May 30, 1868, in Bradford, where she attended the public schools, and after graduating from the home academy, entered Wellesley College. Here she took a five years' course, scientific and musical, and received the degree of Bachelor of Science in 1889. During a large part of her college life she acted as secretary for the professor of history, thus acquiring an experience which has been highly useful in other positions. After leaving college she taught in Bradford Academy, then for two years at Plattsburg. New York, and then in Pontiac, Illinois, afterwards returning to Bradford, where she taught for three years. She married, July 6, 1899, David Sloan Conant, who is now serving a second term as state's attorney for Orange county. The club and society life of Mrs. Conant has been active and useful, and she is especially apt in planning and carrying out social events. Various Bradford institutions have profited much from her effort, especially the public library, in which she has always had a keen interest. Upon the election of her mother to the office of national president of the Woman's Relief Corps in 1901, Mrs. Conant was appointed national secretary of the organization. In assuming the duties of the office her first work was to make marked improvements in the books, papers, etc., and she issued special instruction blanks regarding reports and other work of the order. All the duties of the office were performed in an intelligent, vigorous and thorough manner characteristic of her.